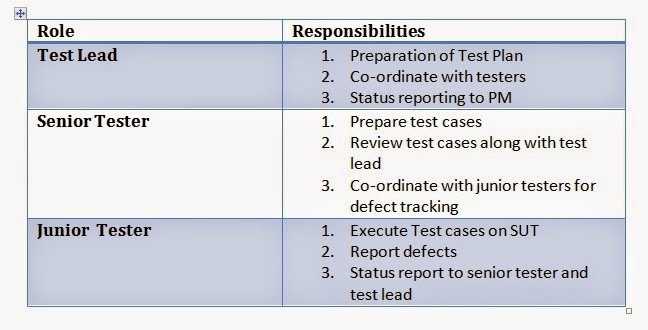 Test Responsibilities in Matrix (TRM)- This matrix specifies the list of responsible testing topics in software testing. Status and Communication- In every two jobs in testing team are co-ordinated via different channels. For example Personal Meetings, Offline Meetings, Online Chatting, Video Conferencing and internal communicator etc. Test Automation and Testing Tools- In this need for test automation in current project and available testing tools in the company is mentioned. Defect Reporting and Tracking- In this required negotiation channels in between developers and testers while reporting and tracking of defects is mentioned. Test Measurement and Metric- Measurement is a basic unit and Metric is a compound unit. In order to estimate the testing process status, testers use a set of measurement and metric. Test Management- Testing team need a sharable location to store all testing deliverables for future called as test base. Risks and Assumptions- In this List of all risks (which might come in future) and assumptions (to overcome those risks) is mentioned. Training is optional to the testers if the testers have experience in the current project. The domain of the current project may be Banking, Insurance, Finance, Sales, Telecommunications, Health Care, eCommerce, e-learning etc.